Let me start of by saying that I love Americans. It’s a fantastic country and the people are great. But for me, coming from New Zealand, one thing about Americans’ approach to diet seems very strange. Most of the readers of my blog and e-book are American. And a very common question I get asked is along the lines of “Am I allowed to eat xxxxxxx on your diet program?” It’s amazing how often I get asked a variation of this question. Am I “allowed” to drink coffee if I have hypoglycemia? Am I “allowed” to eat fruit if I have hypoglycemia? And the word “program” is often used. I think one reason for this tendency of Americans to think they must have strict rules about diet, and “programs” to follow, is because that is what doctors tend to do. If you have a certain disease, the doctor will give you a list of foods you “can” and “can’t” eat. Because the doctor says it, then it somehow becomes equivalent to a law. Over the years, I’ve seen all kinds of weird diets that doctors have told their patients to eat if they have hypoglycemia. Many of them, I would not personally recommend. So, to get back to what you are “allowed” to eat. If you read my free report and my e-book, you’ll see I recommend you avoid sugar and everything containing sugar, as much as possible; and also reduce caffeine – plus be careful with alcohol. The thing is, though, you may find that you can eat a very small dessert at the end of a balanced meal, and it doesn’t have any adverse effect at all. In this case, you might as well enjoy it. We are all slightly different. 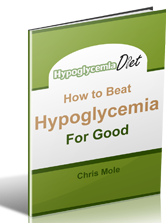 While there are geneal principles that apply to everyone with hypoglycemia, you need to experiment with your own diet and see the effect different things have on you. A lot of Americans find the freedom of my approach just too hard to accept. They would rather have a “program” where I tell them to eat 2 ounces of this and 4 ounces of that, with a warning that they must follow it to the letter to see any improvement. If that’s what you want, then my e-book is not for you. 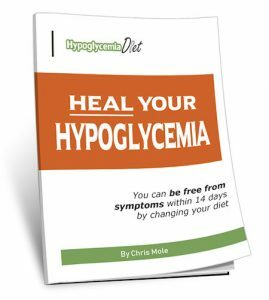 But if you want to experience true freedom and abundant health, with a diet that you can actually live with for a lifetime, then you will find my e-book to be a breath of fresh air among most of the other books written on hypoglycemia. The Truth About Grains – Should You Eat Them? Please understand that we Americans (like the rest of you) are being conditioned to NOT take responsibility for ourselves or our actions. If you give me a bite-by-bite program to follow and it doesn’t work, then it’s YOUR fault, not MINE. Being hypoglycemic and living a balanced life needs to be about taking personal responsibility and controlling your own environment–tough stuff! I’m a Yank. And I didn’t take offense. I think the misconception comes from the word “diet”. Here in the US, diet books usually have strict guidelines and detailed meal plans. I do find your use of the term very refreshing. It’s more like a way of eating. I’ve been using the “diet” for 5 months – I’ve never felt better. It’s wonderful. And the emails are very helpful. Thank you! The reason every one these days want “rules” and plans is the fact that for almost 30 years now we have been dictated to by authorities, government departments and the media as to what we should and shouldn’t eat. Nobody remembers how eating was before the eighties with the accompanying “rules”. Nobody remembers the baker, the butcher and the milkman delivering our daily essentials and one is hard pressed to even find natural butter in the supermarket anymore, much less full cream milk or real cheddar cheese. We have simply forgotton how to eat! I have been reading your suggestions on meal planning and it is very helpful to me. I have been a hypoglycaemia for only one month now and I never want to be that sick again so I am very careful as to what I eat! Thank you for all your help.